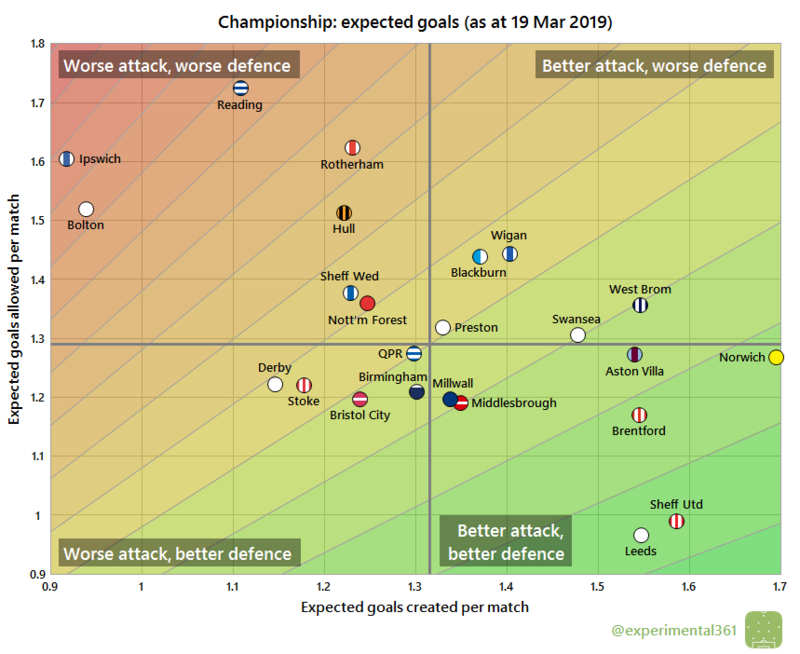 In raw shot terms, Leeds have been the division’s most dominant side, with Brentford still close to them overall despite sitting in the bottom half. Hull meanwhile sit in the top half of the table (just) but are being out-shot to the same extent as several of the clubs battling relegation. Of the teams in the most danger, both Millwall and Rotherham look healthier here than their league position suggests, with both close to a team challenging at the top of the table. The size of the gulf between Bolton, Ipswich and the rest of the division is pretty depressing for fans of those two clubs: they create far fewer chances than anyone else and haven’t exactly been clinical when presented with opportunities. Rotherham and Middlesbrough have had similar frustrations in front of goal despite at least firing in a decent number of shots, while the low number of chances created by Hull has been offset by some sharp finishing. Middlesbrough remain a case study in resilience, having soaked up an impressive number of shots for each goal conceded. 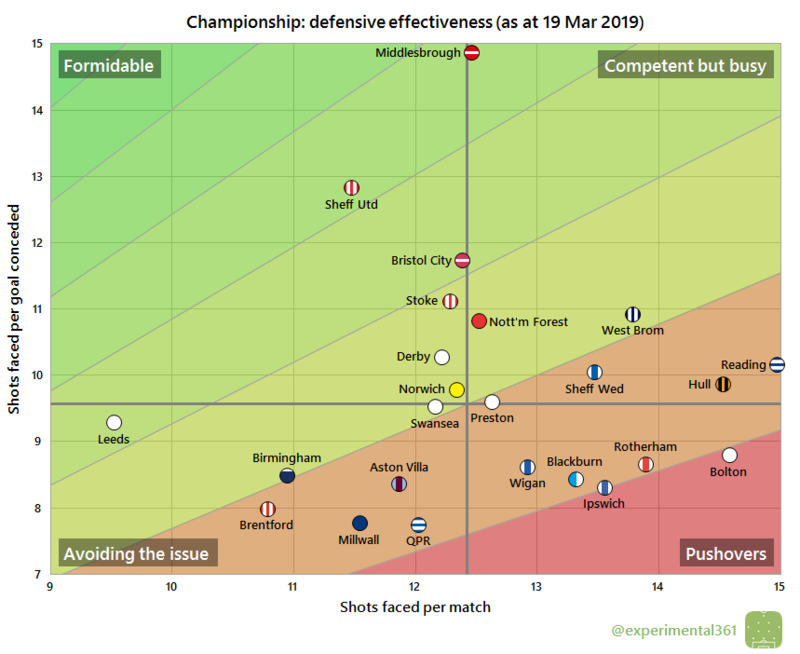 Sheffield United and Bristol City also deserve a mention for being tough to breach, while QPR, Millwall and Brentford have conceded frustratingly often given how few opportunities they usually allow their opponents. 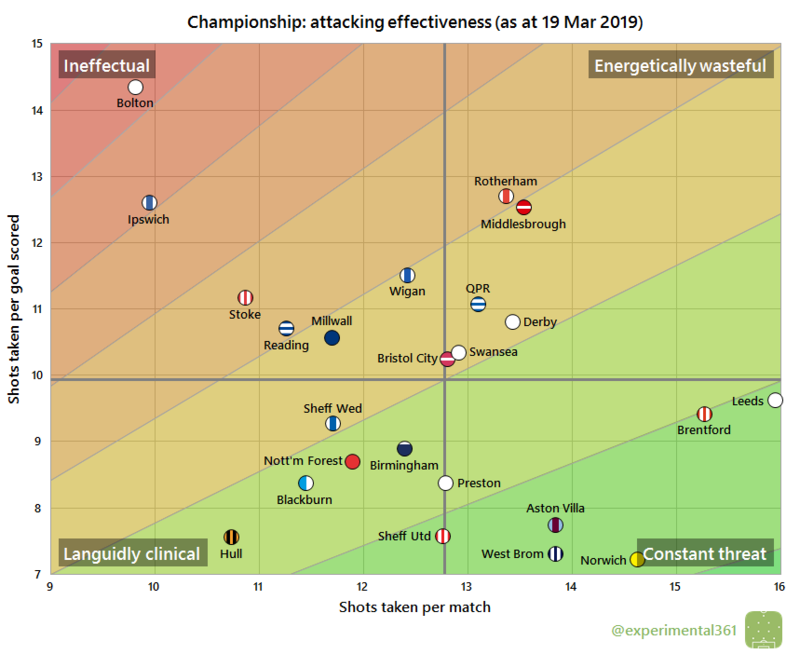 When we adjust for shot quality – at least as well as I can measure it – then Sheffield United and Leeds are almost inseparable. Norwich, West Brom and Aston Villa have looked excellent going forward but relatively average at the back. 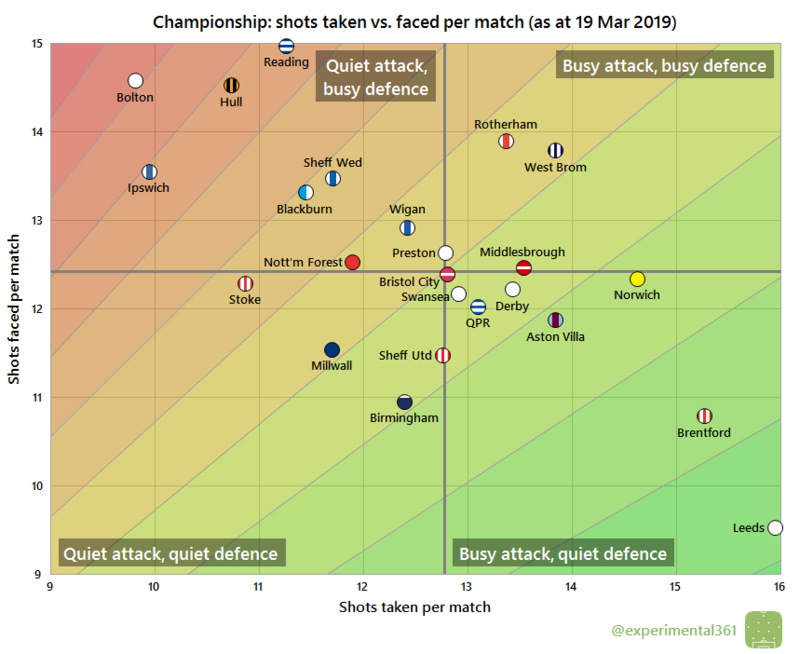 Things don’t look any healthier for Ipswich or Bolton here, and Reading – who rank worse than either defensively – are also in a spot of trouble if something doesn’t change.